Author: Christa Kilian-Hatz. Series edited by: Wilhelm J.G. Möhlig. 10 pp. Roman, 543 pp. 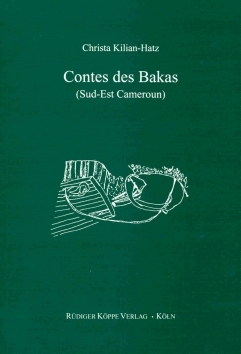 The book presents a collection of 22 narrations of the Baka, the largest of the three pygmy ethnic groups in the south of Cameroon with about 30,000 members. Their language belongs to the Adamawa-Ubangi languages. In the form of songs, proverbs and stories, oral tradition holds a prominent place in the spiritual world as well as the daily life of this hunter-gatherer ethnic group. The content of the narrations usually is of an instructive or mythical nature. They are told on ritual occasions, e.g. during wakes, the hunting ceremony or the dances in honour of the forest spirits, but are also used in more mundane areas, like the education of children or during the general evening entertainment. The stories concerning mythological characters form a special sub-set in the oral literature of the Baka, including the story cycle of Waito. In Baka society, Waito is a culture hero whose stories and actions explain the origin of social norms and values, taboos and rituals. Waito is characterised by being gluttonous, egoistic, brutal, and with a profound lack of morals and respect. Thus, he embodies the anti-type of an individual conforming to the social values of the Baka. The actual text collection is preceeded by an exhaustive introduction dealing with the language of the Baka and their oral tradition. Each of the texts is given in the Baka original with an interlinear morpheme translation, followed by a French translation, annotations and an interpretation.